Good Morning! It's Sara from Design a Party by Sara and today is my day to share a project with you and I am so excited to finally show you what I have been working on! A very good friend of mine is getting married in June and this past weekend was her Bridal Shower. 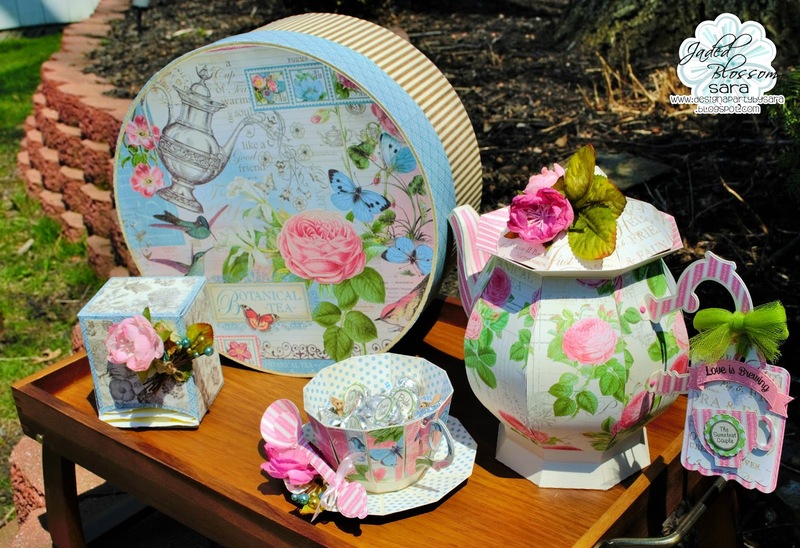 Her theme was a Tea Party, SERIOUSLY, how fun is that! Knowing her and knowing how much she loves different and homemade items, I knew I wanted to make her something special that she would love and cherish. She is also a photographer so I thought she could even use the items in a photo shoot as well. I started searching for the perfect paper. I knew I wanted something elegant and pretty. I already had the perfect kits, they were from SVG Cuts. They are Honeybee Tea and Tea For You and Me. I decided to go with the same paper collection that Mary from SVG Cuts used in the Honeybee Tea kit. It was just too perfect all around. 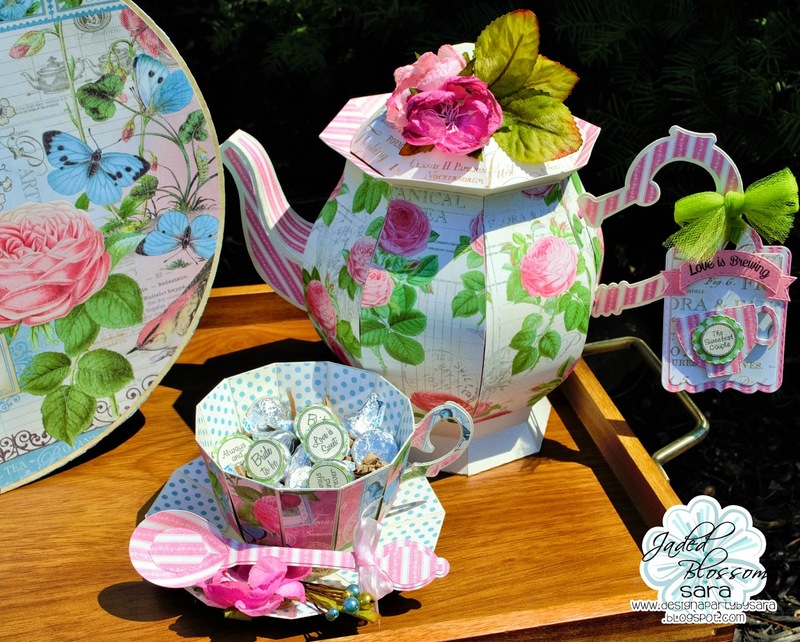 I used the same patterns that she did for my teapot too. 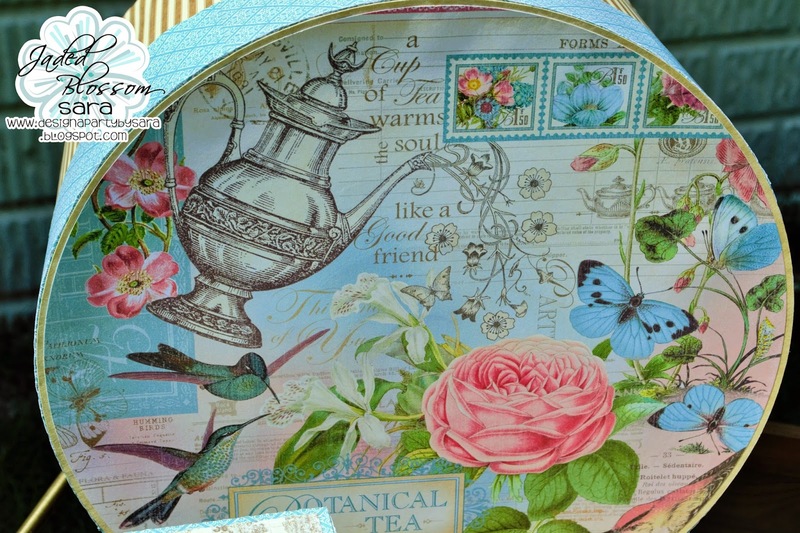 The paper collect is from Graphic 45, Botanical Tea. I have never used their paper before. But I fell in love with it. It cuts so nicely and is even more pretty in person! The teapot is from the Honeybee Tea kit. The lid comes off too so you could add some kind of treats or even a little gift. 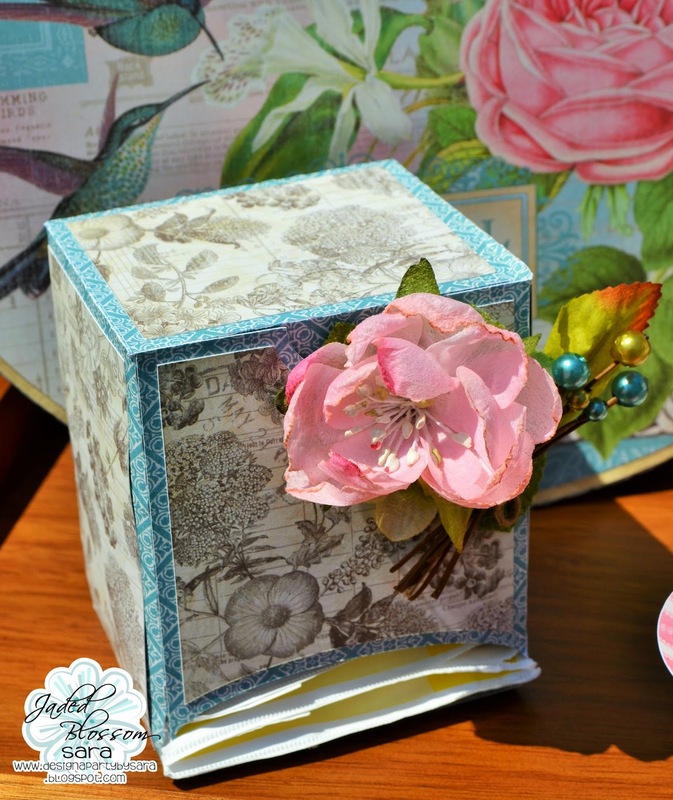 For the hat box I did use a third kit from SVG cuts it is Dress Shop. These 12x12 layout papers from Graphic 45 are great for the top panel of the hat box or even a giftbag. I had to use it, it is too pretty not to. I cut all of my pieces out and assembled everything. I spent about one week to make everything and just did little bits at a time. 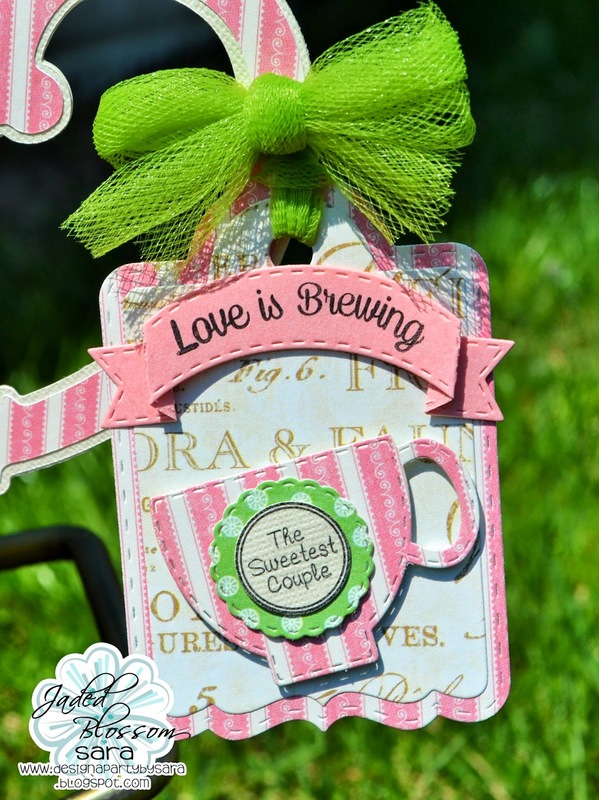 I made a tag from the Jaded Blossom Treat Tag Die and cut out the cup from the Baking Dies. Then punched out the Sweetest Couple sentiment from the Wedding Candies set and added it to a Candy Charm and Banner die. I cut out a banner from the Dimensional Banner Dies and stamped the Love is Brewing sentiment from the Perfect Match stamp set. I tied it onto the teapot handle with some tulle that I had in my stash. 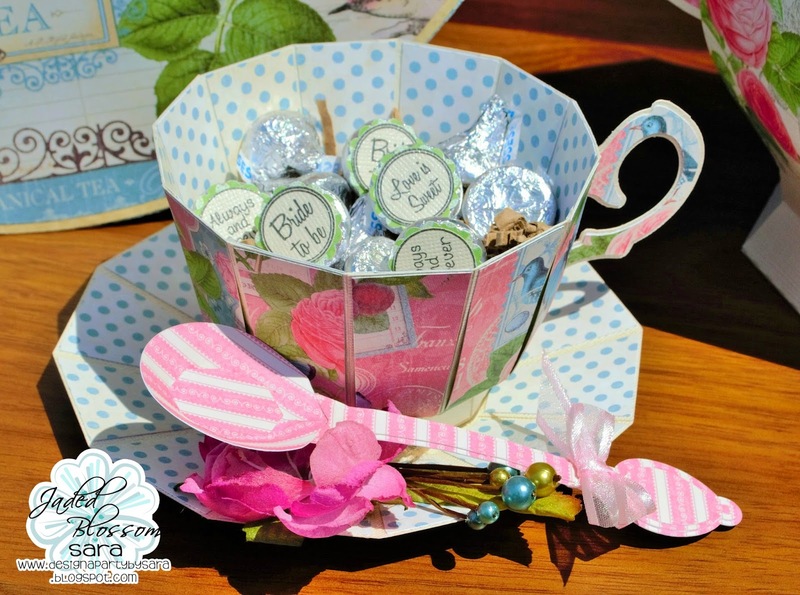 I couldn't leave the teacup empty so I added some kisses to it with the Wedding Candies on the bottom. I also added flowers from my stash. Sara, This is ABSOLUTELY AMAZING!!!!! What an amazing gift! wow, you have to be so proud to give it to her. It's truly fantastic. This is amazing! I'm so in awe! OH MY GOODNESS!! That is just AMAZING!! !